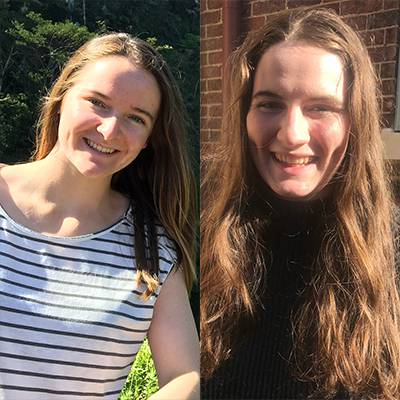 Students Sian Morgan and Sara Urquhart completed the WIL program in 2018. The Monash Biomedicine Discovery Institute’s (BDI) first year of undergraduate industry placements were an overwhelming success, with strong engagement from both our biomedical students and industry partners. The Monash BDI’s Work Integrated Learning (WIL) program aims to enable students to develop experience and understanding within non-clinical industry environments. Students take a credit-based subject that involves local and international placements in variety of industries including agriculture, scientific and technical services, education and training and healthcare. Closer links between future graduates and industry partners will be formed through the WIL program. Students gain an understanding of what industry expectations are for graduates, and gain workplace and real-world experiences and skills. Students have reported transformative experiences, through professional development and a focus on transferrable skills. Sian Morgan completed her placement at BioMelbourne Network, an association for Victorian organisations engaged in biotechnology, medical technology, pharmaceuticals and health innovation. “Having completed the WIL program, I now also have the background knowledge to appreciate how these skills can be used in the workforce. The ‘soft skills’ or ‘employability skills’ we discussed at university were extremely pertinent to achieving team projects,” she said. Sian said her placement at BioMelbourne Network opened her eyes to the different pathways she can take after her degree. “I used to believe I had three options post biomed – medicine, academia or healthcare. Now a new door has appeared to industry. Previously, I had just a vague connotation of this word. Today, it is a sector I would be proud to be part of and to build a career in,” she said. Sara Urquhart was placed at Barwon Centre for Orthopaedic Research and Education (BCORE). According to Sara, what she had learnt so far during her degree was a great base of knowledge for the placement, but that she didn’t really know what to expect. “I had originally thought that all research was very solitary, however during my placement I worked with a range of people from very diverse fields. It was great,” Sara said. “My supervisor was excellent – incredibly supportive. He even asked me to read one of his journal submissions and provide feedback. I was very surprised he valued my opinion. I think this is a testament to how highly employers value Monash graduates,” she said. Program coordinators Associate Professor Julia Choate and Dr Daniel Czech said the response from industry mentors has been incredibly positive. “Many industry partners have requested more students, and some have made offers of part-time and full-time employment for those who have been placed with them,” Dr Czech said. “Our industry partners reported that our biomedical science students are ready for work. Our WIL students are well placed for their future career success,” Associate Professor Choate said.